Growing up, I always felt like an outsider, like I wasn’t a real American despite being born and raised here. My black hair, dark skin, thick eyebrows, and twig legs on a short stature—stood out painfully amongst the sea of blonde and brunette white peers. Fob. “Go back to India.” When kids would come over to my house, they would laugh at the “strange” Indian gods and goddesses and tease me for my parents’ accents. I was taught at an early age to hide my culture as best as I could – to renounce my Indian-ness and continuously “defend” my America-ness. I became ashamed of my heritage. By the time I was a teenager, I had become “practically white” to my friends—a label I wore proudly. By being “practically white,” I felt like I made it. I was a real American. I was not an “other.” The “other” Asians only had Asian friends. They only listened to “Asian” music and gossiped “rudely” in their native languages. Those “other” Asians weren’t American enough. Little did I know that at the University of Virginia, I would join the Indian Student Association and the Asian Student Union and find myself thrown into the largest group of Asians I had ever been exposed to. Turns out I wasn’t as different from my Asian American peers as I thought; I often had more in common with my Asian and South Asian friends than my non-Asian friends, despite being “practically white.” As a teenager, I navigated my world as a hyphenated person: two halves of a single identity that were always separate. Embracing my undesirable racial identity as Asian meant inherently giving up my desirable “Americanness.” I had spent too long defending my Americanness, too long trying to fit in with the white majority, to give it up by embracing my “fobby” Indianness. Having other Asian friends showed me how my perceptions of race, of what it means to be “American,” were misguided. Our identities do not fit neatly into clearly defined boxes; there are no clean dichotomies where if you are one thing, you cannot possibly be another. The Asian American community introduced me to others that shared my struggle with a hybrid identity. We shared our experiences of having racist taunts hurled for being brown in a post-9/11 world. Of being stereotyped as being “good at math” and made to feel inadequate if we weren’t. We felt the blunt of ostracization for expressing any “un-American” part of our heritage. 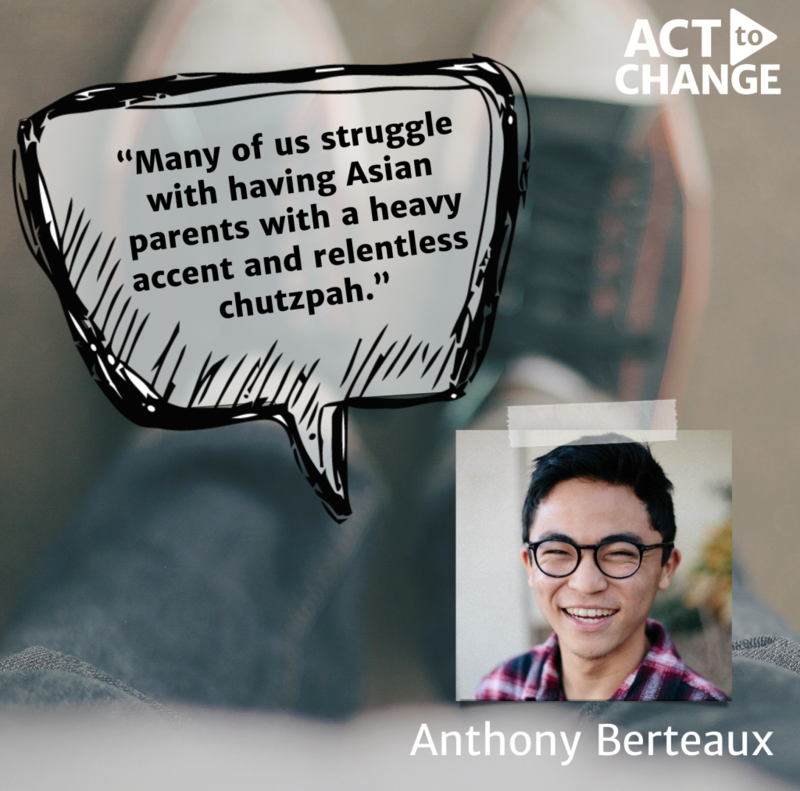 The stereotypes that led others to call me a fob were the stereotypes I had been reinforcing by refusing to accept the other half of my identity; in my desperation to be accepted, I was widening the very racial gap that hurt me as a child. Too often, “Americanness” is equated with “whiteness.” Too often our social constructs allow us to be ignorant, to let racial stereotypes and dynamics define our own perceptions of self. Do not allow yourself to be pigeon-holed by the perceptions of what society thinks being Indian, Asian, or even American, means. Being a South Asian-American does not fit neatly into any preconceived notions. It is not about choosing between two halves of a hyphenated identity; it is an intersection as nuanced and complex as each of our individual identities. None of us are inferior Americans just because of the color of our skin. Embracing my Indianness does not deny me any part of my Americanness. 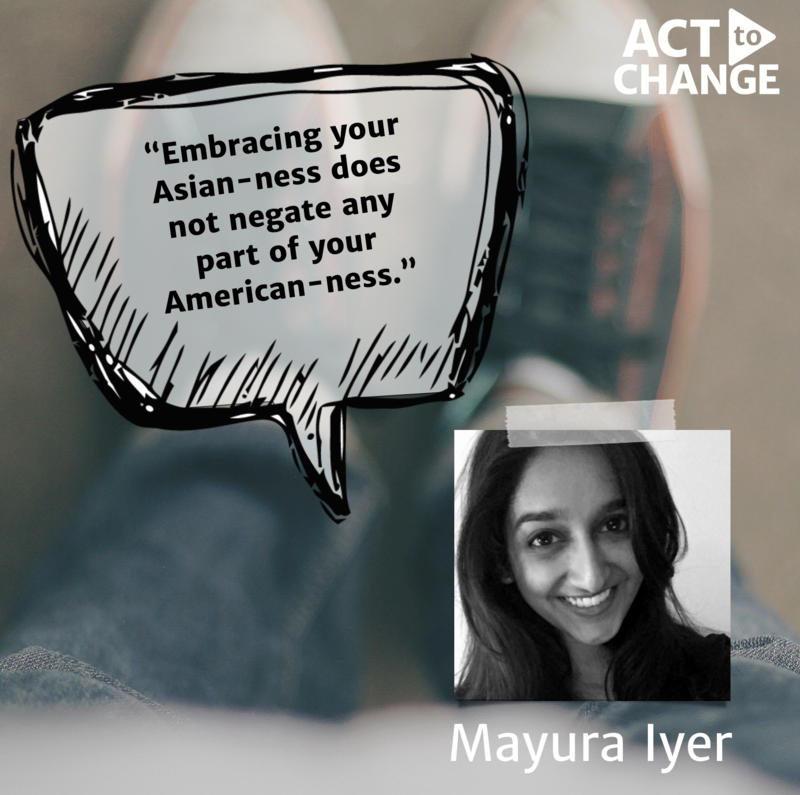 Mayura Iyer is a graduate of the University of Virginia and a current Master of Public Policy student. She hopes to use her policy knowledge and love of writing to change the world. She is particularly interested in the dynamics of race in the Asian-American community, domestic violence, mental wellness, and education policy. Her caffeine-fueled pieces have also appeared in Literally, Darling, BlogHer, and Mic.com. It is the course of actions that precede us that ultimately define our future. My life’s path was paved well before I was born. In fact, it was paved almost two decades prior in 1965, with the passing of The Immigration and Nationality Act. Through my mother’s foresight, my parents and two sisters left Bombay (or what is present day Mumbai) for the “land of the free and the home of the brave,” trading in mangos and fresh coconut juice for pizza and coffee. They landed in Carteret, NJ, a humble, industrial, working class town in the central part of the State. But as the third South Asian family to move into Carteret, my family was greeted by a petition to bar them from purchasing a house and racial epitaphs viciously spray-painted across the front entrance. For the sin of our ethnicity, my sisters and I were targeted and attacked in school — frequently physically and sometimes violently. Taunts and bullying began well before I even understood their meaning and progressed in their viciousness from verbal assaults to physical abuse. There was the eighth grade boy who broke a glass bottle on my head to the sixth grade teacher who announced in front of the whole class that I should “go back to where I came from.” The consistent thread weaving everything together was the herd-like mentality among my peers. I was never just bullied by one person – it was always done with a leader followed by those cheering the bully along while I was tormented. But this isn’t a story about the impact of being a first generation American. It is a redemption story. A story that illustrates life doing a full circle and bringing closure – closure you thought you’d already taken care of. A little over a year ago, I reacquainted with a bully from my formative years. He did not remember me or the past that we shared, having been more of an engaged participant than a lead tormentor of my childhood. As often is the case for the bullied and oppressed, I had to let bygones be bygones in order to move forward with my life with a positive attitude. Our similar professions led our lives to intersect regularly, and our interactions were always very pleasant. We even worked together a project for the Boys & Girls Club of Newark, securing funding to directly impact the nutrition and health of over 300 children in Newark. Is it fair to judge a person on the worst of experiences? Would I want to be evaluated when I am not my best self? Is redemption possible if the person being redeemed is unaware of it? As I continue to reflect on this deeply felt experience, I see so many lessons within it. Lessons in redemption’s timetable, in letting go and moving on, and the many layers to forgiveness. Lessons in what time is capable of doing. Lessons that only the pain of adversity can deliver. And that there is the American way. Overcoming adversity. When the American way is going on as intended, it’s something we’re all doing together — bully and bullied, forgiver and forgiven, redeemer and redeemed, arm in arm. Aware or unaware. But overcoming. 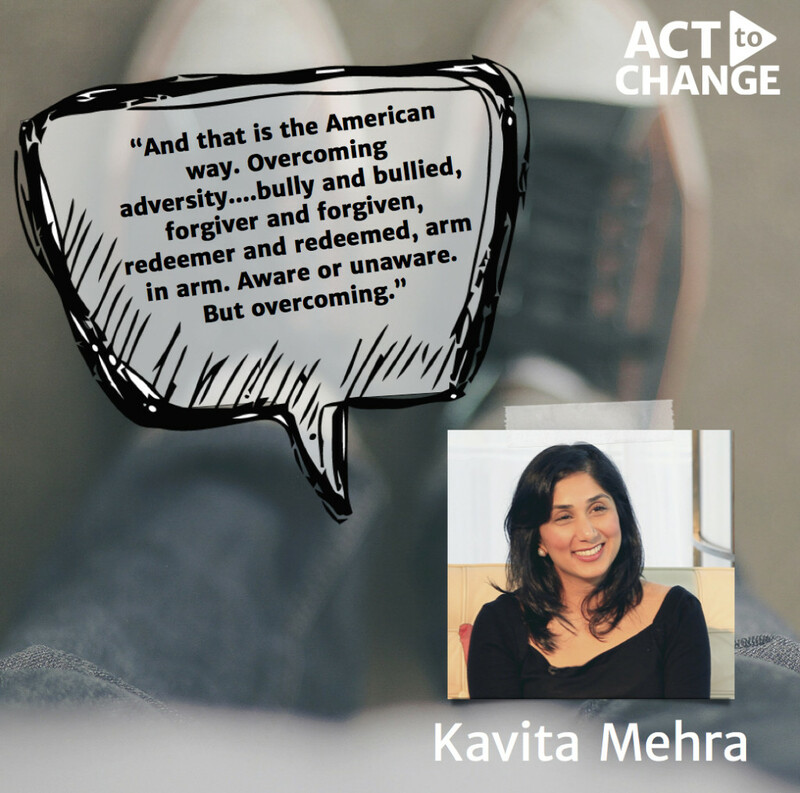 Kavita Mehra is the Chief Transformation Officer for the Boys & Girls Club of Newark, the first and only individual to occupy this title out of 4,200 Boys & Girls Clubs across the Country. In her role, Kavita works directly with the Chief Executive Officer to grow and manage all aspect of the organization. Kavita has blogged for the Huffington Post, and has been featured in leading media outlets including NY1 and Meet the Leaders. In 2015, Kavita was featured in “Roshni: Emerging Indian Global Leaders” for her work in the not-for-profit sector. Kavita completed her Bachelor of Arts from New York University with a double major in both History and Gender Studies. She also holds a Master of Arts in Liberal Studies, with a concentration in South Asian Studies, from Columbia University.